This is a discussion of my painting and framing techniques with a description of the pastel medium for those not familiar with it. Technically, Pastel is powdered pigment, rolled into round or square sticks and contained by methylcellulose, a non-greasy binder. It can either be blended with finger and stump, or left with visible strokes and lines. Pastel is among the most permanent of all media, for it never cracks, darkens or yellows. Historically, its origin can be traced back to the Sixteenth Century. Among the galaxy of artists to use pastel were Delacroix, Millet, Manet, Renoir, Toulouse-Lautrec, Vuillard, Whistler and Hassam, just to list the more familiar names. Degas was the most prolific user of Pastel, and its champion, for he raised it to the full brilliance of oil. His protege, Mary Cassatt, introduced the Impressionists and Pastel to her wealthy friends in Philadelphia and Washington, and thus to the United States. Today, many of our most renowned living artitsts, have distinguished themselves in Pastels, and have enriched the world with this glorious medium. 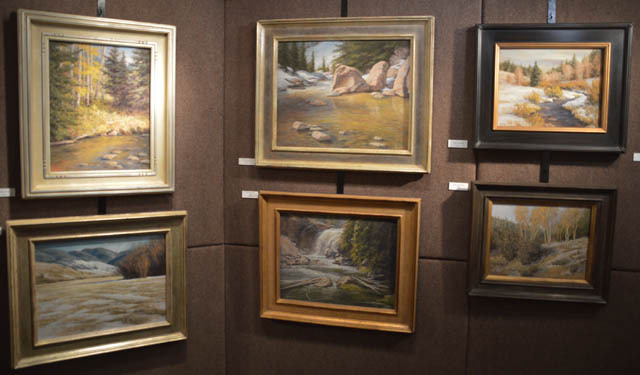 Framed paintings on display at Western Masters Exhibition, 2014. The first step in framing is to create a nearly airtight package consisting of the painting on its solid hardboard surface, a spacer, and glass. The spacer keeps the pastel separated from the glass. There are varying opinions on the necessity of this but I am following common practice by assuring at least an eighth of an inch separation. I use a product which adheres to the edge of the glass so it can't come loose and flop around inside the package. The glass I use is TruVue Museum Glass. I've tried other conservation glasses and found them to have a slight darkening effect on the painting that I find objectionable. Museum glass is 99% transparent to visible light but blocks almost all the UV rays that could damage the painting. Any painting will fade over the years if exposed to direct sunlight. Pastel is one of the most fade-resistant media artists can use. UV protective glass adds one more level of protection. The thing I like most about the museum glass is that it cuts reflections by a significant amount without the blurring that you get with non-glare glass. There is a reason museums use this glass! It is really fantastic. You can hardly tell there is anything between the viewer and the art. The painting/spacer/glass package is sealed with frame sealing tape all around. The result is a nearly airtight unit that will withstand the elements. The sealed package is placed in a fairly wide gold or silver frame. Since the painting and glass are a sealed unit, the painting/glass unit can be safely removed from the frame with a small screw driver should the owner ever wish to replace the frame. Since so many people seem curious about what pastel is and how it is used, this section describes some of my methods and materials. It will be mostly of interest to other artists who are considering working in the medium. Pastel as a painting medium has been around for a very long time. 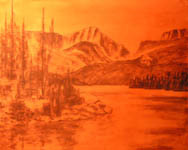 Over the centuries each pastel artist has developed their own techniques for preparing a painting surface, applying the pastel pigment and finishing the work. I've gleaned some of my methods from other artists, always experimenting and refining techniques until they suit my own preferences. Pastel is usually applied to either textured paper or hardboard. Smooth surfaces don't hold as much of the soft dry pigment as rough ones do. Most pastelists work on a surface that has at least a little "tooth" or roughness. I prefer a surface I prepare myself using finely ground pumice powder, a kind of volcanic rock, and liquid gesso, the same white material oil painters prime their canvases with. Several coats of the pumice mixture are applied to a sheet of hardboard (Masonite) over a base coat of PVA size. The size is a sealant which along with the gesso isolates the hardboard matrix from the pastel pigment. The gesso mixture is allowed to dry thoroughly. This gives me a board that is stiff and sturdy enough to take a lot of knocking around and it has just the amount of roughness I like. Sometimes I leave brush marks in the gesso which add interest to the painted surface. A pure white surface is distracting to me so I prime the textured board with color. My preference is a light gold ochre. It adds a subtle warming effect where it shows through on the finished painting. Painting begins with a loose charcoal sketch on my textured board. The sketch is then converted into a charcoal value study. This is an important step in helping me evaluate the composition before applying color. At this stage the drawing can still be removed if the composition needs correction. A workable fixative such as Krylon is used to set the charcoal and keep it from mixing with the color layers that come next. I spray fixative until I can't rub the charcoal off with my finger but not so much as to fill the tooth of the surface. It is better to apply several coats of fixative instead of trying to do it all in one shot. Color is applied in whatever order seems intuitive for the subject and composition. I don't have any hard and fast rules. Often I start by massing in a darker shadow tone and then building the midtones and finally the highlights but other times the subject might suggest that midtones first would work better. Sometimes light and atmosphere are added as glazes over local color. One thing I like to do is not paint the color I see directly but let two different colors blend either on the painted surface or in the viewer's eye to create the desired color. I might use warmer and cooler versions of the color or richer/greyer, etc. to achieve the effect. That gives me livelier colors than if I just use a solid tone from the beginning. Some pastelists use cross-hatching to get a mix of colors. I prefer to work more like an oil painter, using the sides of the pastel sticks to achieve a wider stroke, varying the pressure to achieve varying amounts of coverage. A very light touch when there is still a lot of tooth is like an oil painter's dry brush technique. Light pressure with hard pastel over soft can give a glazed effect. Heavier pressure with a soft pastel can actually build up a little impasto on the surface that I find attractive. 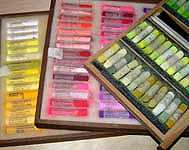 My favorite pastel brands include Terry Ludwig, Schmincke, Unison, Sennelier and Rembrandt. I'm sure there are other good ones - I haven't tried them all. I probably have nearly a thousand colors but only use a quarter of them on a regular basis. In any given painting the total used is well under a hundred, sometimes only a dozen.